This morning we had a huge and much better all you can eat breakfast at Sizzler. 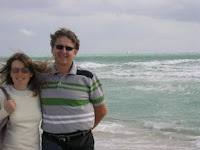 We then hit the road and arrived in South Beach at about 4 pm. On the way there we stopped in Palm Beach and went for a swim. We made a tour of the town in our car and saw many nice old and new buildings, hotels, churches and upscale shops. We took an instant liking to South Beach. It reminded us of little coastal towns at the Adriatic. After checking in at the Whitelaw we parked the car in a municipal garage on Collins and 13th. You don't need a car in SoBe. The Whitelaw, as the name goes, is white both from the inside and the outside. The lobby is all white with vinyl sofas and so is the furniture in the rooms. Surprisingly, the walls in our room were painted pink. It was another hot day so we hurried to the beach. The beach is huge with colorful lifeguard huts. And guess who we saw - a Miami Dade police car and two police officers in shorts. They were not on the CSI team, though. What they were doing was keeping nosy tourists off a TV shooting - nothing spectacular, though, they were making a commercial for a new Chevy. The most beautiful Art Deco buildings are on Ocean Drive. It's full of restaurants and bars, with people sitting and eating at tables on the sidewalk (so much like Zagreb). The most crowded bar was the one with waitresses in skimpy leotards. No wonder why. Lincoln Road seemed to be the busiest part of SoBe by night.